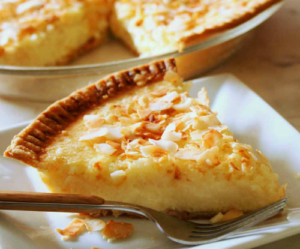 A simple but delicious coconut-custard filling in a flaky pie crust and topped with whipped cream and toasted coconut flakes. Here is an easy dessert recipe for Toasted Coconut Custard Pie. Prepare and bake pie crust according to recipe; set aside. Spread coconut flakes on a baking sheet and bake at 350°F (175°C) until light golden brown, about 8 to 10 minutes, stirring frequently. Set aside. To make the filling, heat 1 cup evaporated milk, 3/4 cup coconut and sugar in medium, thick-bottomed saucepan over medium-high heat until simmering. Remove from heat; let stand for 10 minutes. Meanwhile, whisk remaining evaporated milk, egg yolks, cornstarch and salt in small bowl until blended. Gradually whisk egg mixture into coconut mixture in saucepan. Return saucepan to medium heat. Cook, stirring constantly, for about 4 to 5 minutes or until mixture thickens. Remove from heat; stir in butter and vanilla extract until smooth. Place in refrigerator for 30 minutes or until cool to the touch. Gently stir in 1 cup whipped topping; spoon into prepared crust. Refrigerate for 3 hours or until set. Spread remaining cup of whipped topping over pie filling. Sprinkle with remaining 1/4 cup coconut. Makes 8 servings.